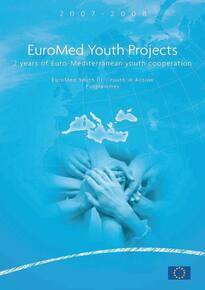 SALTO-YOUTH - EuroMed Educational Report Collection "Bringing both sides together"
EuroMed Educational Report Collection "Bringing both sides together"
SALTO-YOUTH EuroMed has launched a serie of educational reports. Each issue is dedicated to a particular training course in details. They are intended for you to use as a ‘resource pack’ of methods and activities for youth workers dealing with the kind of issues and activities which we looked at during the trainings. They also aim to increase transferability and promote methods used to develop quality in projects. Issue 11: Democracy within the EuroMed context: Illusion or reality? Issue 5: "Train EuroMed Multipliers!" Issue 4: "Education and Civilisation. Influence on EVS"
Issue 3: "Common Memory - Common Heritage"
Issue 1: "Jump Into EuroMed Youth Exchanges"
This document is an evidence of the second edition of the event “EuroMed Youth Awards”, after Cairo, Egypt in 2005, held from the 10th to the 14th of June 2013, in Dead Sea – Jordan within the framework of the EU-funded EuroMed Youth and Youth in Action programmes with more than 70 participants coming from 11 European countries (Belgium, Bulgaria, Cyprus, Greece, Finland, France, Italy, Malta, Poland, Portugal, and Spain), 1 Programme country of the Youth in Action Programme (Turkey) and 6 neighbour countries from the Mediterranean area (Egypt, Israel, Jordan, Lebanon, Palestine, Tunisia). This impact study aimed to address the following question: ‘To what extent have SALTO EuroMed training activities had a positive impact on personal and professional development in a Euro-Mediterranean context from 2008 until 2013’.